MadPsychMum | Singapore Parenting + Travel Blog: We Are a Finalist of the Singapore Blog Awards 2013! We Are a Finalist of the Singapore Blog Awards 2013! This came as a huge surprise! 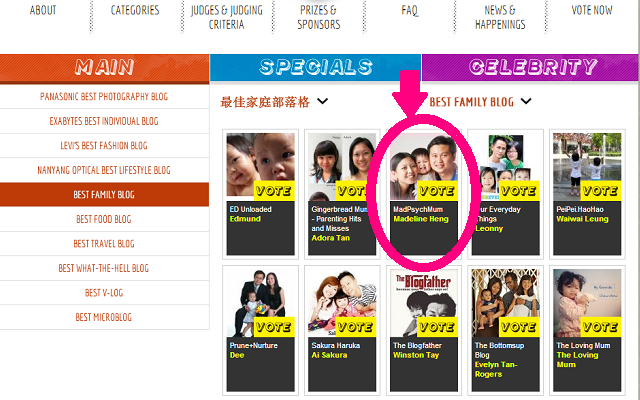 We made it to the TOP 10 in the Best Family Blog category of the Singapore Blog Awards 2013! O.M.G! Now if you reallly love me and realllllly want to support me (pretty please! ), you can help by VOTING for me! Online voting by the public constitutes 30% of the total score, so I need your votes! !